Do you have problems with a slow Mac or annoying popups and ads taking over your browser causing headache? You just found the solution. Antivirus VK Pro is the perfect choice for your needs. 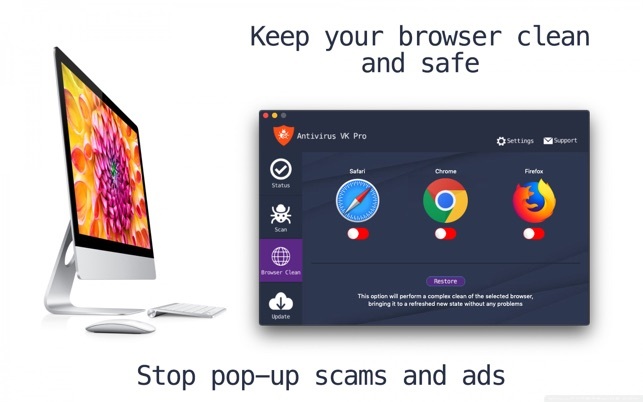 It will restore your browser and clean your Mac from any malware it finds. NEW! Live detection of suspicious applications. Stop worrying that you had downloaded and installed a suspicious application. Antivirus VK Pro got your back! We are actively scanning the Applications folder and alert you when we find something suspicious. 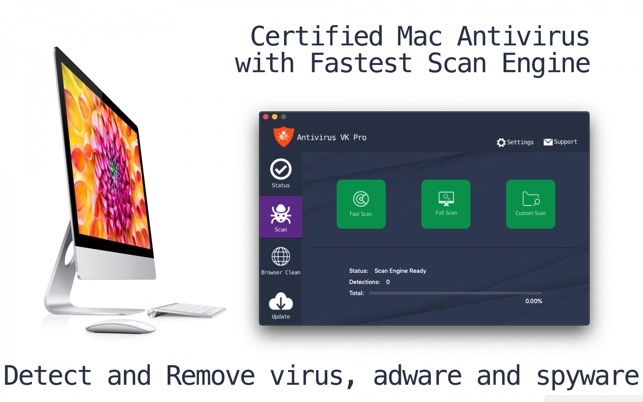 Detect and remove malware found in your Mac. - Browser Clean - give your browser a new life. It will restore your browser clean any suspicious findings. The Antivirus VK Pro will detect also Windows malware. Keep others safe also and be able to scan your Windows installation Bootcamp with only one product. Besides that, you will also get the best customer support you ever meet. Just give us a shout and we will be more than happy to assist you. So stop wasting time finding other solution for your Mac. Your Mac needs help right away. Start cleaning your Mac right now! Even trusted websites can get hacked, and criminals can easily spoof emails from your friends or bank. Antivirus VK can also scan your emails and see if there are any phishing attempts. Antivirus VK scans all your files and folders from your system thoroughly. Its scanning engine has passed all the EICAR test files and detected over 4 million malware. With the advancement of technology and internet era, it is very likely that the system can get affected very fast leading to corruption of your hardware. The virus can attack your system in any form which makes it necessary to keep all your files safe and uncorrupted. "Antivirus VK" has an intuitive user interface with great performance. The app quickly makes a thorough scan of all the files in your system. The upcoming releases also focus on the new look with more usability options along with features to detect new viruses. Download the app and keep your system always protected from malware. The antivirus app is daily updated to detect new malware and fast mirror servers for latest updates. Stay updated and stay protected with "Antivirus VK." The free version will only be able to detect if your Mac got malware. To clean your Mac you can activate a free 3 day trial. Subscriptions will auto-renew unless canceled. － Subscription may be managed by the user and auto-renewal may be turned off by going to the user’s Account Setting after purchase. — No cancellation of the current subscription is allowed during active subscription period. — Subscription automatically renews unless auto-renew is turned off at least 24-hours before the end of the current period. — Your account will be charged for renewal for the amount of your current subscription within 24-hours prior to the end of the current period. All cost for subscriptions are mentioned above. We are constantly working hard on making the “Antivirus VK” app better and more useful for you. Please feel free to email us for any queries/suggestions/problems or if you just want to say hello. If you have enjoyed any feature of the “Antivirus VK” app, do rate us on App Store. I have only used this program for a short period, but found it to be quite efficient in it’s performance. Yes, it’s a yearly due, But so is all the other antivirus protection programs. You want something good, you pay the price, you don’t really care, than use a no pay program. It’s simple, you get what you pay for, and this one’s definitely worth the money. I just ran the Malware program, and it found 21 errors/malware in my emails. I will definitely be using this more. Keep my system running top notch. Again it’s a great system, although there are 3 parts to it that you can run. When finished, you try to delete the errors it found, and it makes you have to do another review. That’s a downfall on the person who wrote this program. Now that I’ve reviewed the 2nd part to the application, hopefully it will let me delete the errors it found. I understand people wanting good reviews, but this is over kill. It’s a GREAT PROGRAM AND WELL WORTH THE MONEY! What else do you want me to say?? OK, it just did the Health Check, and quickly, perhaps too quickly? Still I feel this is the best on the market for your money! AntiVirus Killer that actually works ! I have had a popup screen showing up on my Mac stating that I had a virus and should click on the attached link. No thank you. After running three different antivirus programs, none of them found anything on my computer. I looked for another program and came across this one. With the free dowmload, could not loose much by trying the software. After the forst run, not only did it identified the popup screen that I mentioned but it also found about 50 other malware and other junk on the Mac. I immediately purchased the yearly subscription which is about as good a price as you will ever find and ran the software whichgot rid of all the malware founf and other undesirables. So far it has been the best Antivirus that I have been able to find. It is worth every penny and you will not be disapointed if you make the purchase. I now run it on a daily basis and yes, it has found other umwanted software on my Mac. Great product, easy to install and update. Completely satisfied with this purchase. It appears to have done a thorugh job scanning and detecting viruses and malware. It also appears to have cleaned up Safari, which was the reason I got it in the first place. So I have subscribed. However, when it was done there was a list of viruses found with a checkbox next to each one. There were three buttons to push: delete (something else) and export results. It wasn’t clear where the results would be exported or whether delete appllied to the enrire list or only to the ones with boxes checked. An explanation for all three buttons would have been nice. Apparently the check boxes are only for selecting the ones NOT to delete. I never did find out where the restlts would haveen exported. A more informative user i nterfacw would have earned five stars instead of four.